2018 is almost over, and it’s been an incredibly busy year for me. I’ve done more speaking and community activities this year than ever before, and had something big going on almost every month! In this, my final post of 2018, I thought I’d take a look back at some of the highlights. I started off the year with my first-ever trip to SQL Saturday Nashville. While the weather didn’t cooperate on Friday (an ice storm shut the venue down, leading to the cancellation of pre-conference sessions) things were back to normal by Saturday and it was an excellent event that I will be happy to return to sometime! 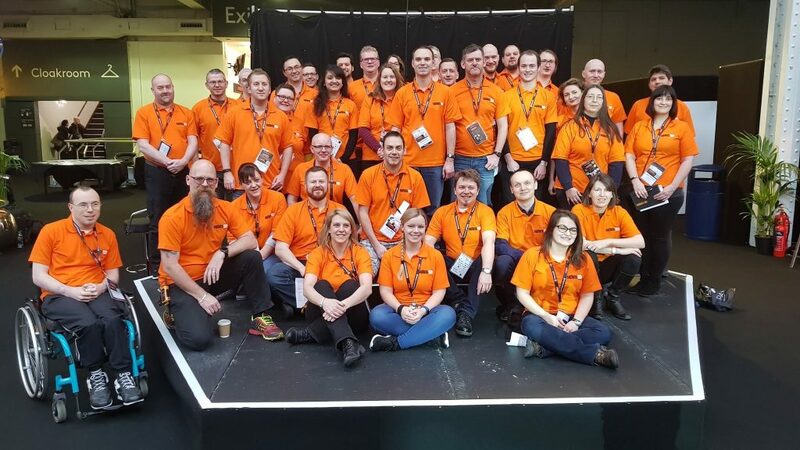 I made my first trip to SQLBits where I volunteered and presented two sessions! I’ve heard so many great things about this conference and had wanted to get there for a few years. I’m extremely grateful I was chosen to present. It was an amazing week in London and I got to meet so many new and awesome people. I can’t wait to return in just a few short months! In March we held our ninth SQL Saturday Chicago (my 8th as an organizer), in a new, larger venue. We were able to accommodate more attendees and pre-conference sessions than ever before, and a great time was had by all! One of my favorite SQL Saturdays takes place in April, and it is also one of the closest to my home; I was very happy to return to SQL Saturday Madison, Wisconsin in early April as a presenter. I presented for the PASS DBA Virtual Group for the first time! Another personal first for me came in June, when I presented a webinar as part of the SSWUG Spring 2018 Virtual Conference. I was very happy to return and speak at the Chicago SQL Server User Group on an exciting new topic: Azure Cosmos DB! September was my busiest month ever, in my busiest year ever. I’ve long-wanted to present at SQL Saturday in Oslo, Norway, and this year the stars aligned and I got my chance! It was an amazing trip and my favorite SQL Saturday by far. I also presented for the Chicago Suburban SQL Server User Group, and I returned to Boston and presented at my second SQL Saturday there. As a Friend of Redgate, I was very happy to help out and speak at Redgate’s SQL in the City Summit in Chicago. 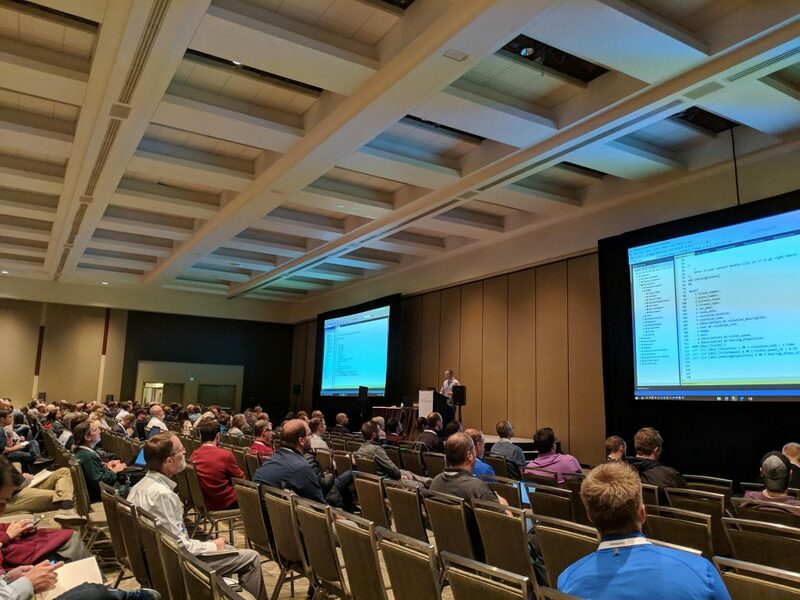 I was once again very fortunate to go on a week-long marathon and present at SQL Saturday Portland, ride the SQLTrain, and deliver two sessions at PASS Summit in Seattle. Not only did I receive extremely positive feedback, but I also had the second-best-attended session of the entire conference! I finished up the year by traveling to Boston and presenting at the New England SQL User Group! 2018 has been a great year of growth for me, both personally and professionally. I believe that 2019 is going to be even better, and can’t wait to see how things turn out! I hope all my readers enjoy the last few days of 2018, and I’ll see you next year! I was going through some papers the other day and came across my undergraduate transcript, something I haven’t laid eyes on in probably a decade. Reading through it was a humbling trip down memory lane. In the 12 years since I’ve graduated, I clearly remember (more like mis-remember) doing better in some courses than I actually did. Also, I have no excuse for my sub-par performance in some classes. But I have no regrets, as this is absolutely a part of what brought me to where I am today. Want to see what I mean? Read below and I’ll take you through my transcript. While browsing Reddit last night, I came across Farewell etaoin shrdlu, a 30 minute documentary showing the last day the New York Times used hot metal typesetting to print their paper, which was July 2, 1978. I’ve long been fascinated by Linotype machines, which cast molded lead “slugs” for a line of type. They’re extremely mechanical and really fun to watch. There are many videos to be found on YouTube detailing how they work. This particular documentary doesn’t go into great detail, but gives the basics. It also shows the entire process – how text goes from the Linotype machine all the way to a printing press. So if you’re finding yourself with some time to kill (and with it being Thanksgiving week in the US, there’s bound to be a lot of time to be killed) give this a watch. It makes me thankful to live and work in the era of computing that I do. Room-sized computers must have been incredibly impressive. Same goes for the “disk packs that can hold 8 million words each!” as mentioned in the video, but I’m quite happy to be where we are now. And I can only imagine that at the tail end of my career, the systems I’m working on now will seem just as ancient. The University of Illinois will always be a special place to both me and my family. I graduated from there, was a proud member of the marching band, and got my start in public speaking there. It’s also the place where I met my wife, and to top things off we were married on campus. We have plenty of Illinois memrobilia of varying degrees of rarity, but the collection I’m most proud of is something so obscure that most Illini fans won’t even know they exist. Fred Turner spent nearly 50 years of his life at the University of Illinois, beginning as a student in 1918, and ending with his retirement in 1966 as the university’s first Dean of Students. 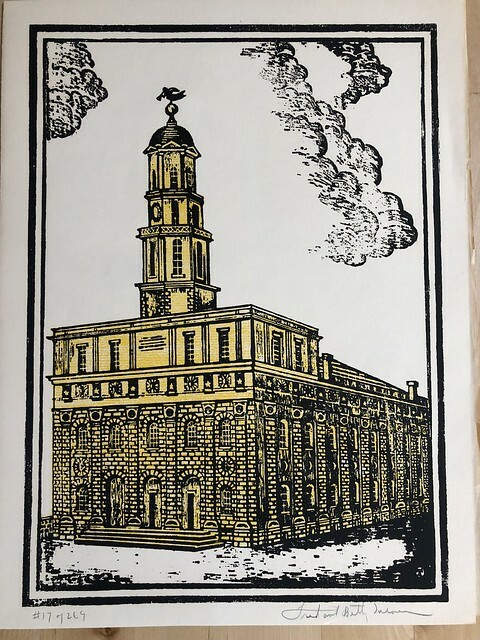 Turner loved Illinois and its history, and in 1946 he and his wife, Betty, decided to highlight these topics in Christmas cards they sent to their friends and family. Turner had recently picked up the Japanese art of woodblock printing, and decided to share it by creating a hand-carved woodblock print of a historical site in Illinois each year as the cover of their Christmas card. For an extra tie to campus, the blocks for printmaking were carved from wood salvaged from one of the University’s earliest buildings. They printed 260-275 by hand at their kitchen table each year until 1974. I can only imagine that most of these cards have been lost to a combination of time and people just not knowing what they are. I know of only two complete sets of all 29 cards. As for my own collection, I’ve got a long way to go – I only have three. I found my first one five years ago, and have only come across two more since. Our trips to Central Illinois frequently involve trips to flea markets and antique shops, and now you know exactly what I look for. If you’re curious to see what more of these cards look like, the university archives has a website showing cards from different years. I’m guessing you’ve never heard of O. Winston Link. He was a civil engineer by degree and a photographer by trade, who in 1955 undertook a personal side project which would end up becoming his life’s work. The Norfolk and Western Railway was the last major railroad in the United States to still use steam locomotives at that point, and Link obtained full permission from their president to photograph the last days of the steam era on their railroad, primarily in Virginia and West Virginia coal country. He was even given a key to the railroad’s switch boxes, allowing him to phone dispatchers to obtain exact arrival and departure times for trains and, occasionally, the ability to request a train be held so a photo could be taken at a particular moment. Hawksbill Creek Swimming Hole. Luray, VA. August 9, 1956. Link’s photos were not ad-hoc snapshots in any way. The majority of them were taken at night (making him one of the first to popularize nighttime photography), and illuminated by enormous flash arrays he built himself. 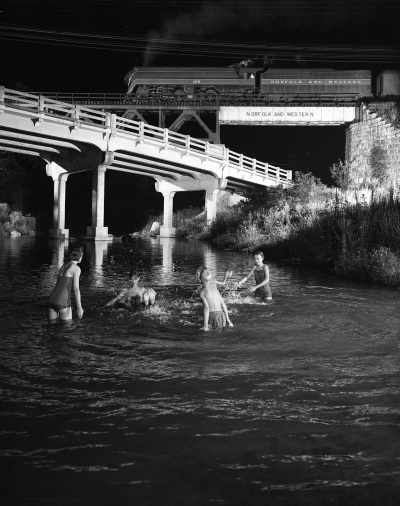 Link said that not only did nighttime photos romanticize the trains further, but steam locomotive smoke appears white, and therefore not dirty, when lit by flash. Utilizing his background in advertising and marketing photography, his photos were carefully composed to tell a story, and almost always incorporate people to add a humanizing element. I wish I could tell you I collect his photos, but that’s not possible. I can only afford to be an enthusiast. Original prints typically sell for thousands of dollars at auction. I do own all of his books, which are absolutely beautiful. The tales he tells in black and white are richer than anything I could ever imagine in color. Link lived in relative obscurity, his photos were popular with railfans but didn’t start to gain mainstream popularity until decades later. You won’t find many photos of him – he preferred to stay behind the camera, but he did have a cameo appearance in one of my all-time favorite movies, October Sky. If you’ve never seen that movie, add it to your list! I like to say that if you watch October Sky, and you recognize the train engineer to be O. Winston Link, you’re really smart and observant. But if you’re a true rail nerd, you’ll also know that the locomotive he’s driving is a 2-8-2 “Mikado” #4501, which was actually owned by the Southern Railway and painted to be a Norfolk & Western engine just for the movie. The N&W never used 2-8-2 locomotives. If you made it this far, thank you for reading about my hobbies. I promise to return to my regularly scheduled technobabble in short order. 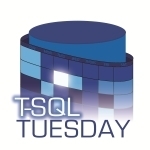 This month we celebrate the 100th edition of T-SQL Tuesday, originally created by Adam Machanic back in November 2009. Adam had asked us to write about what topics we might be covering 100 months into the future. I’m not good at predicting the future, but in the spirit of time travel, I am going one month into the past and writing about last month’s topic which was hosted by Aaron Bertrand. 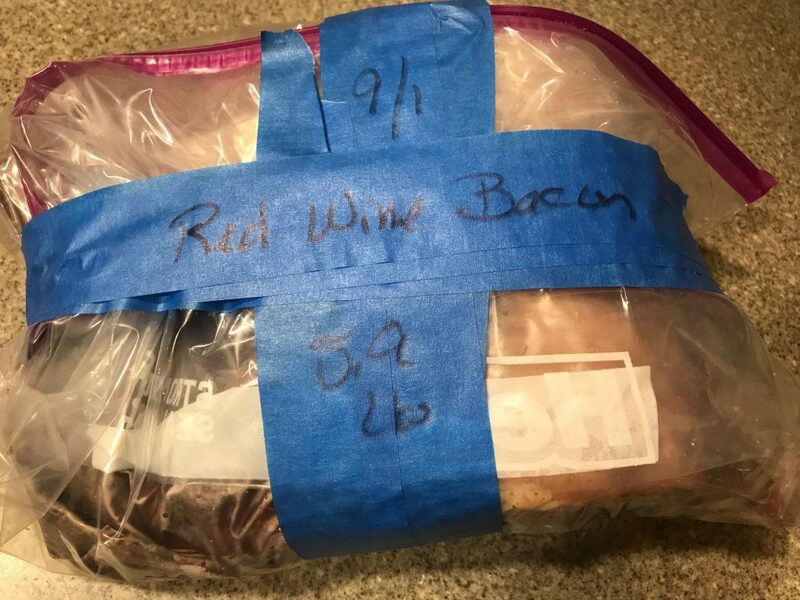 Bacon Blog Day 7: If Kale Can Be A Thing, What About Red Wine Bacon? It’s also great in stews and coq au vin and it’s amazing in beef bourguignon. One other thing: Until you get a chance to try bacon that isn’t mass-produced, you don’t realize how much flavor real bacon has. Producers like Oscar Meyer inject their bacon with water because they sell it by the pound. Water is a cheap way for them to bring their bacon up to the weight on the package. When you taste bacon that hasn’t been watered down, your taste buds will be surprised. 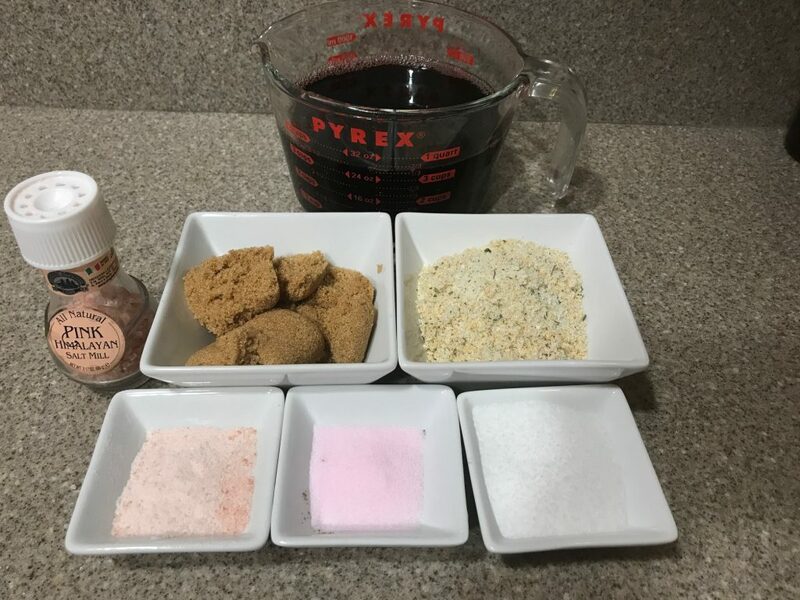 I adjusted my recipe to the size of my pork belly and I was short on the Kosher salt so I substituted some of the Himalayan salt. See my post on salts as you do NOT want to make substitutions for the curing salt. Put all of that into a plastic bag. Make sure you double bag it because it will inevitably leak in your fridge. And that’s all you gotta do. Put it in your fridge and then flip it over daily so the cure gets a chance to soak into the belly.